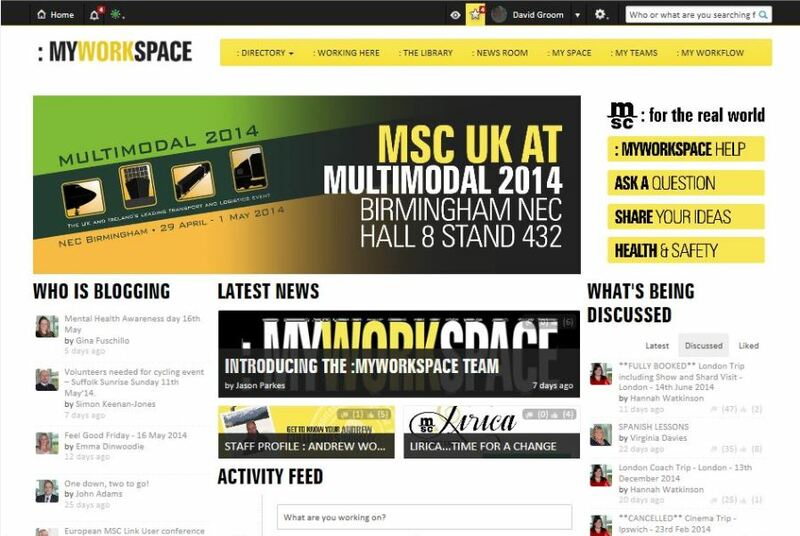 Launched on 9th December 2013 :MYWORKSPACE has been warmly welcomed by our UK team as a platform for open communication, collaborative working and a new channel to share information. Replacing an old-fashioned system which was impersonal and difficult to navigate, :MYWORKSPACE has revolutionised the way in which we work together as one team. With offices positioned throughout the UK our new intranet has helped our teams to work and communicate efficiently together, introducing an element of social collaboration that we’ve struggled to achieve in the past. We love :MYWORKSPACE and the support it offers to our working lives and we hope you’ll love it too! I can honestly say the new site is a ‘breath of fresh air’. It’s clear, simple and very easy to navigate. Well deserved entry into the competition. I have to say I really love this intranet design and would feel very proud if I worked at MSC. One of the best Interact Intranet designs I have seen and looks so stylish, modern, clean, easy to use and navigate around. I hope you do very well in this competition.